You made the investment. They are achieving their dreams. In today's edition of "Turning Tassels Achieving Dreams," we are spotlighting two Project GRAD Akron scholars who are flourishing in the world of the arts. These scholars are pursuing collegiate journeys, both locally and internationally, in their specialized fields while investing time into following their passions while achieving their dreams. As we invite you to continue reading our "Turning Tassels Achieving Dreams" series, we would like to thank you for your support and for believing in our motto that G raduation R eally A chieves D reams! Tesha McCann is a Buchtel High School graduate and a Project GRAD Akron Scholar. Skilled with the talent to transform messages into artistic visuals, Tesha's hard work resulted in a full-tuition scholarship to pursue a degree in Visual Communications at Kent State University. Tesha’s passion for the arts started long before her college career. Initially in high school, she thought a career in fashion design would be the perfect fit. After taking a diverse curriculum of exploratory courses during her freshman year at Kent State University, Tesha soon realized that she had a calling for graphic design and communications, ultimately making the decision to pursue her Visual Communications major.
" College has been nothing short of a fun experience ", Tesha said during her winter interview as she described her involvement with various organizations and students groups offered on campus. The university life can be overwhelming as some students figure out time management and balancing priorities. 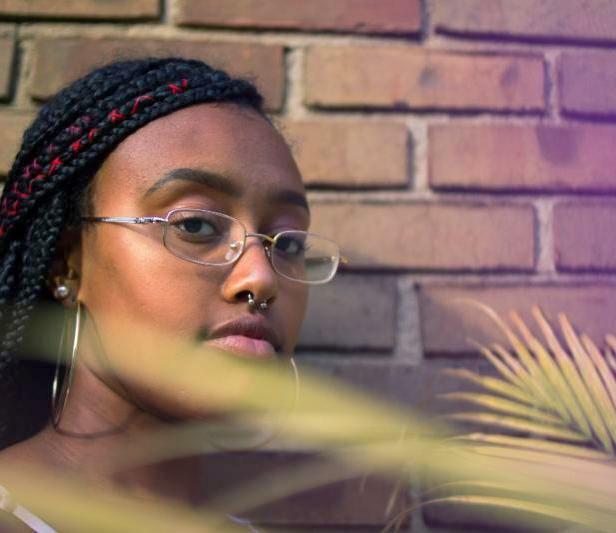 To overcome this challenge, Tesha communicates frequently with her Project GRAD Akron mentor for guidance; as she completes her courses to prepare for her career as a Visual Communications Designer.
" 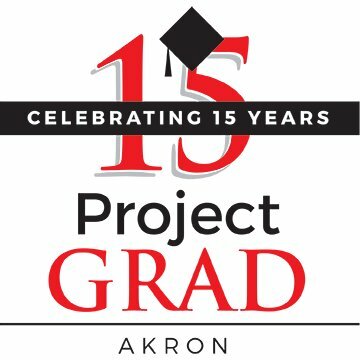 My roommate was also in Project GRAD Akron. She was a great reminder that I was at Kent State University for a reason. Everyone at Project GRAD Akron was there for me . " Tesha has something to say about college and her Project GRAD Akron experience . TUNE IN to her interview. Joshua Porter is a Buchtel High School graduate and a Project GRAD Akron Scholar. Very skilled and musically talented, Josh is composing the final chords to his senior year at Clark Atlanta University. Pursuing a Bachelor of Arts degree in Music, Josh will graduate in SIX days! Focusing on his studies while perfecting his craft, Josh has maintained the Dean’s List as well as balancing his obligations to the community throughout his college journey. 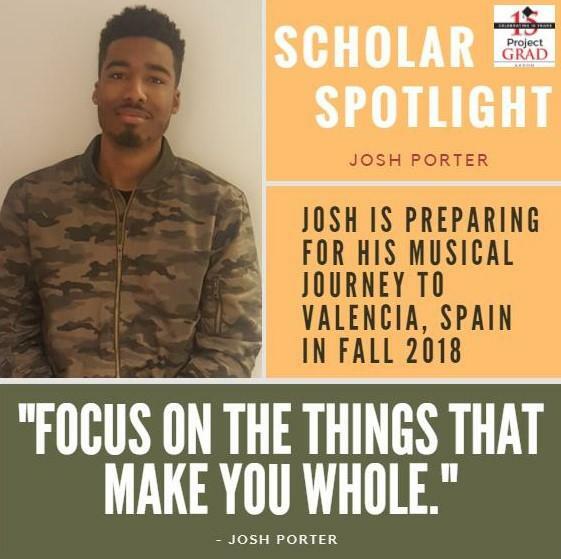 With such persistence and the desire to grow as a musician, Josh has worked hard to be admitted into graduate school at the prestigious Berklee College of Music Valencia campus in Valencia, Spain. Josh will begin his journey in the Fall of 2018. During his graduate studies overseas, Josh will have the opportunity to further develop his artistic ability as well as increase his musical proficiency through a very challenging curriculum. In the meantime, Josh is very hands on in both Akron and Atlanta, performing for different organizations as well as local events. 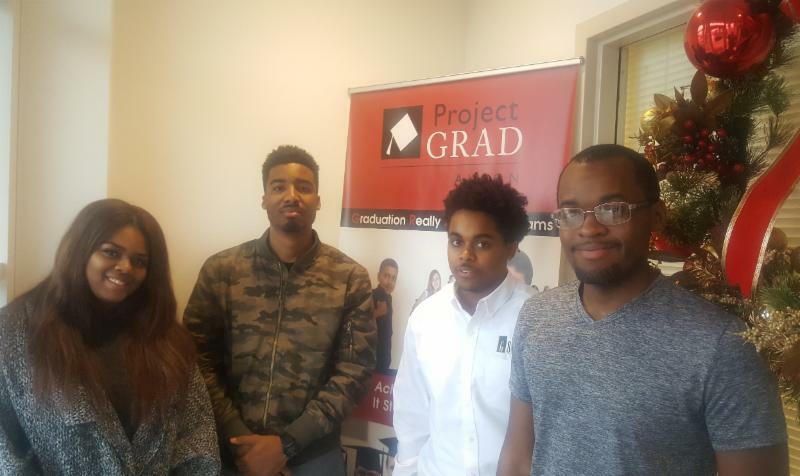 Camille Hurd, Josh Porter, Cordele Harris, and Akil Gregory stop by the Project GRAD Akron office during their winter break from school. ﻿MOST IMPORTANTLY, OUR SCHOLARS . Check out the Turning Tassels Achieving Dreams Form below.